The fact that Munich wasn’t my first stop in Germany, actually brought me in a center of ridicule. Yeap. Other Germans who are not from Munich, or the Southern Germany, didn’t appreciate the Oktoberfest. Despite being a world’s famous event, many Germans think it’s simply a useless festival where people actually have an excuse to get drunk and act crazy. As for me, I was actually DYING to be a witness of those drunken event. I am such a good girl, the friends that choose tend to be as good. In other words, I never had the luxury of having to take care of a drunk friend and witness his or her silly act. When I was in Prague, I saw some really drunk people in a club. Those drunk people were having red faces, more like extreme blush, and they had those crazy eyes. Plus, they seemed to be as horny as hell when they see any kind of girls. So, I arrived in Munich as excited as ever. Kinda didn’t know what to expect. Oh yeah, prior to my arrival in Munich, planning on going to Munich during the Oktoberfest is crazy exhausting. Hostels were overly booked, and Lisa and I didn’t have money to spend on those expensive hotels. (Not so) surprisingly, couches to surfed were full. Or in my case, Lisa and I found out that lots and lots of girls (because we only aimed girl or couple hosts) refused to take any surfers during the Oktoberfest. Who would want to accept a drunk person to stay in your house with a chance of this person banging on your door at 5 a.m. and puking all over your bathroom (if this person can make it to the bathroom, that is)? Thankfully, Lisa and I convince a single mother who was extremely kind enough to accept us in her home. She had a tiny little place and a toddler, and she was still generous enough to take us in, after she said no for the first time. Lisa wrote her a long message explaining that we don’t drink and we would respect her and her son by not getting home late at night. 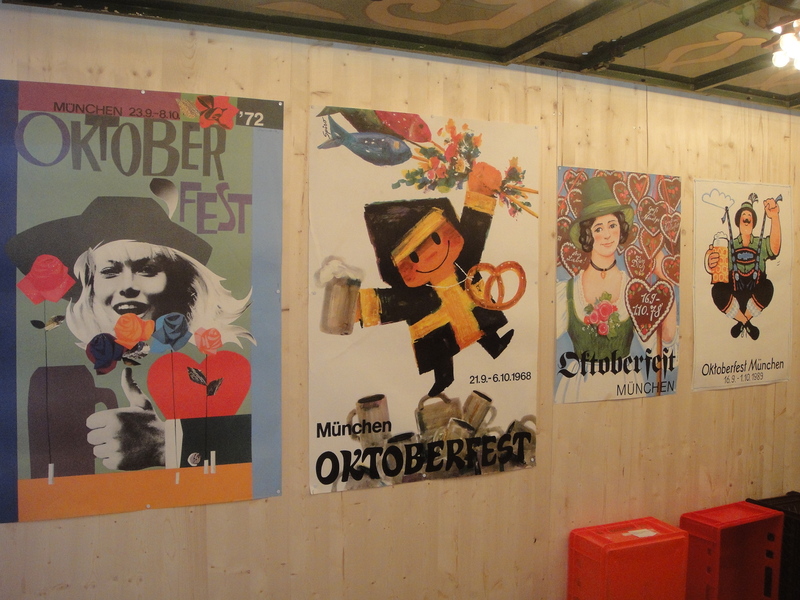 As I have spent several paragraphs above writing about Oktoberfest, I have to also warn you that I actually didn’t do a lot of things in Munich, which will be reflected on the pictures below. Except for the Oktoberfest, I basically only went to the city central, in which I saw this pretty town hall. 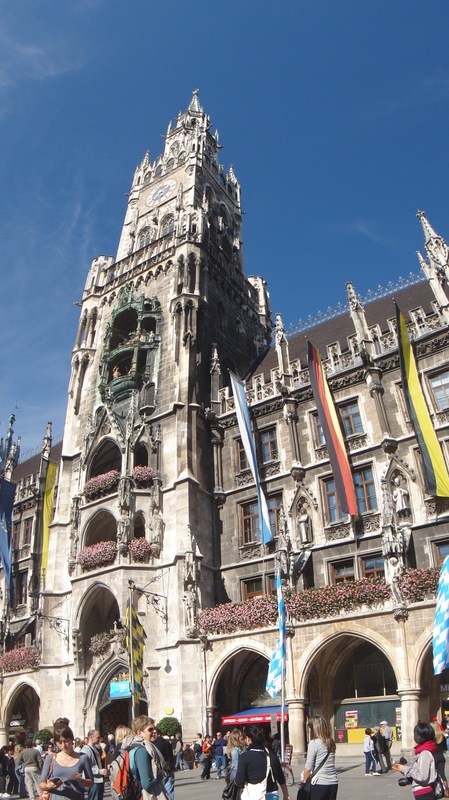 Another thing about Munich and Oktoberfest was, in my opinion, it was the most crowded city in Germany. Out of all the other cities I went in Germany, at the time when I had this Small Trip, I could never find any other city with these many people. Within the area of the above square and town hall, Munich had a pretty vas variety of shopping offer. There were a pretty big H&M and C&A on one of the small street and other shops too. The cool thing that I found in the downtown area was this rickshaw. I have never seen any rickshaw that looked very similar to the Indonesian one in other countries. I just had to stop and take a picture. So, to cut to the chase, here’s what Oktoberfest looked like. It is basically a gigantic fair, with tons of different rides, thousands food stalls, and hundreds of beer tents. On the picture above, you could see one of the huge beer tent (the building on the right, with a large beer glass on top), two different rides (a ferries wheel and a small roller coaster), and the enormous number of people. By the way, the three people (or two and a half *wink*) who are basically the main object of this photo was our host Liane (the girl), Lisa’s boyfriend Peter (the guy), and Liane’s son Ludwig (the small boy). When I saw the crowd inside the Oktoberfest, I was overwhelmed. In some parts of the festival venue, I could hardly move! And in some beer tents, there were long-long lines in order to get in. The same thing also happened when I went to buy food, I had to fight for it. I mentioned beer tents often enough. There were hundreds of long tables inside one tent and it was never empty. EVER! Once, Peter, Lisa, and I wanted to have a table, because Peter would like to have a glass of beer, and we failed. And that situation applied in every tent! About the drunk people, of course I saw many of them! Seriously, Oktoberfest was like a GREAT excuse to be drunk in a broad daylight. All the time when I was in Munich, I heard the constant ambulance sirens going. Lisa and I were curious enough to ask. And yes, during Oktoberfest, the ambulances are busier than usual. There was one incident in one beer tent, though. I was only peeking into one tent, and see what it looked like, suddenly, a guy was stumbling around me. He looked very flushed and red. I was a bit shocked and afraid, because I was told that you would never know what a drunk person could do. So, Peter pulled me away from the crowd. And a few seconds later, this guy threw up on someone’s shoes. Then, a few seconds after that, another guy, not far away from him, puke on the wall. The most disgusting scene I’ve ever witness! And guess what people used for drinking their beer? It was not an ordinary beer glass. Here are the two types of glass that were famously used in those beer tents. You can also compare it with the regular beer glass. The cool thing about Oktoberfest, I think, was that many-many people dressed for the events. Lots and lots of people were putting that traditional Bavarian Dirndl. From the small toddler, to the old folks, lots of them were proudly wearing their own dirndl. The silliest thing that Lisa, Peter, and I did when we were in Munich was going to a dirndl shop and tried some of them on. We managed to take couple pictures of Lisa and I, but now is not a good time to publish it. On the very last day of Oktoberfest, the historical part of the festival was opened. I learned that, although Oktoberfest had always been about beer, but there was something more to it. It was a festival where everyone was supposed to bring out their farm products and animals, back in the olden days. So, the historical exhibition was situated more or less like the ancient Oktoberfest, which was full of stories and different types of farm animals like horses, chickens, and sheep. It was pretty nice, especially minus people that puke or drunk. I also found this posters on one of the wall. And I am gonna leave you with that. Though I don’t think I’ve seen that much of Munich, I think visiting the city within the time of Oktoberfest was a good choice! Munich was the last city I visited in Germany. My next stop after Germany was Portugal, where my best and worst incident happened!